This building is one of the country's most well-known examples of Buddhist architecture and the only original structure of the Byodoin Temple complex that remains today.Yorimichi Fujiwara, who built Fujiwara's heyday, turned his father (Michinaga Fujiwara)’s villa into a temple and was founded in 1052. Look on the back of a Japanese 10 yen coin and you'll see Byodoin Temple's famous Hoodo Hall, also known as Amida Hall or Phoenix Hall. 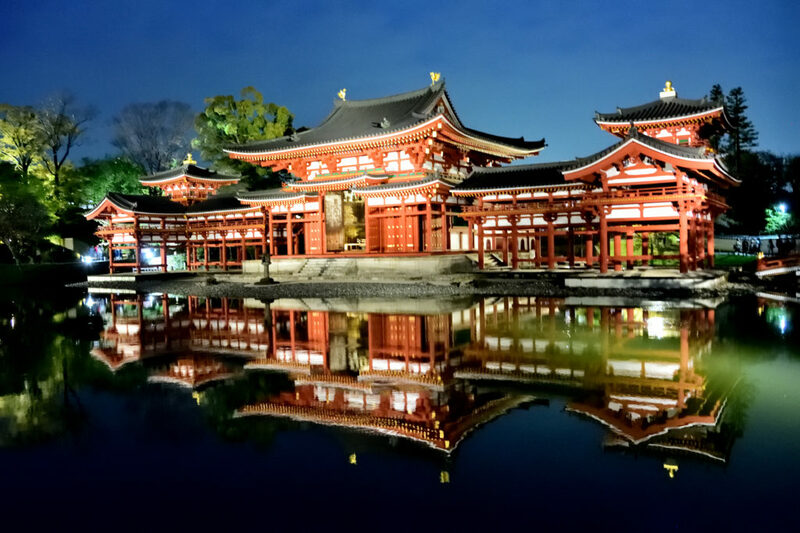 The figure, which is erected facing the east and forms a beautiful Pure Land Garden with the surrounding shallow ponds (Aji Pond), is said to mimic a palace that floats in the Pure Land Treasure Pond. The weeping cherry blossoms with “Byodoin temple” that hang on the water surface. 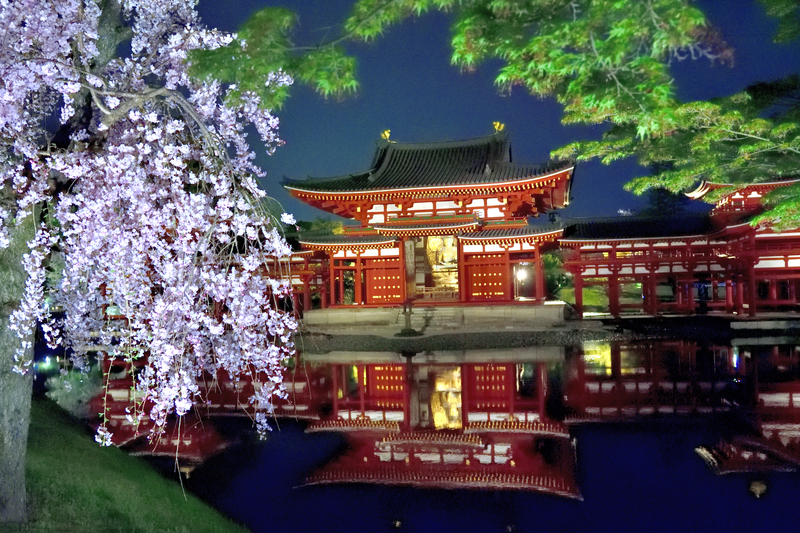 “Byodoin temple” is a famous spot of cherry blossoms, and that conveys the Heian period culture that creates the world of the paradise pure world in the present age. Cherry trees are lined up on the outer side of the “Aji Pond”, which extends on the left wing side, and you can enjoy the weeping cherry blossoms that hang on the water surface. The contrast between the light pink cherry blossoms reflected in the water surface and the lighted-up “Hoodo” is excellent.